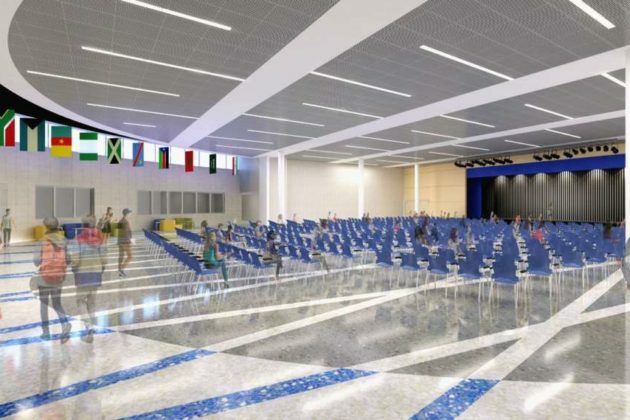 (Updated at 5:12 p.m.) While kids were off from school during winter break, Langston Hughes Middle School (11401 Ridge Heights Road) kicked off 2019 with renovations as a part of its planned expansion. The first move of the school’s renovation took place during winter break, Principal Aimée Monticchio wrote in an email to the school community today (Jan. 4). “We look forward to a new, modern and larger building after the renovation,” she wrote. 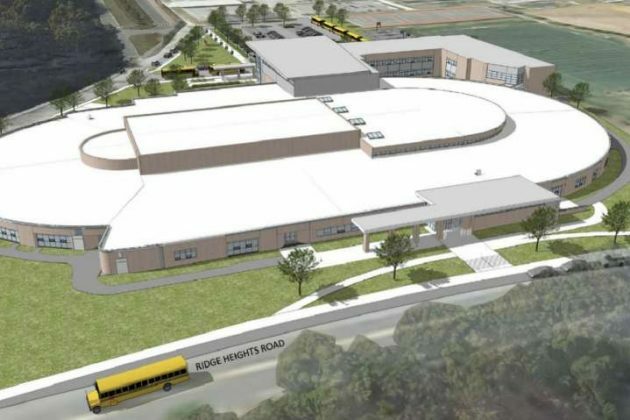 Originally constructed in 1979, the expanded school is set to be 189,000 square feet and serve 1,250 students, according to Hughes Group Architects. The $39 million improvement program will be done in phases with the occupied construction project spanning five phases across three years. 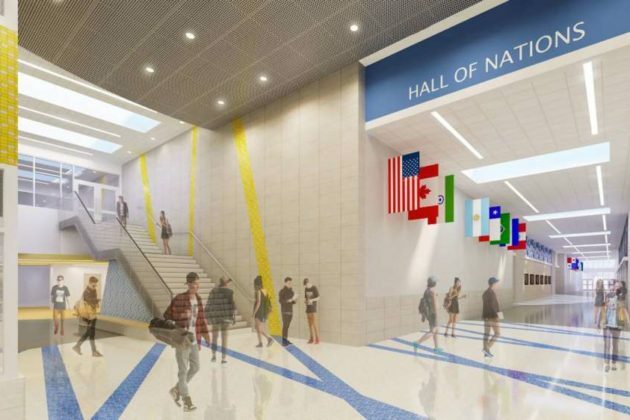 The project includes a central court called the “Hall of Nations” — a collaborative and flexible space meant to serve as an auditorium, a classroom or a breakout space. 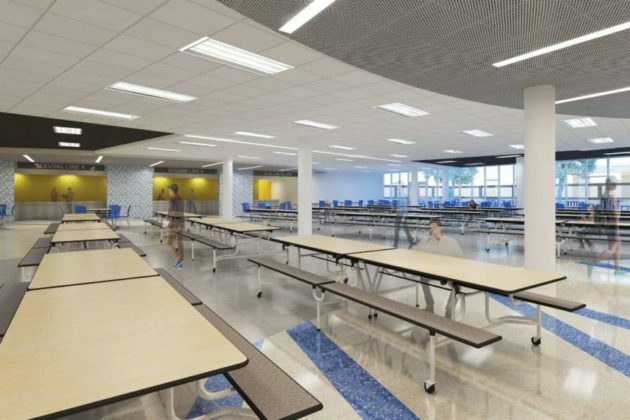 The project also includes renovating the cafeteria and adding a new dining courtyard. 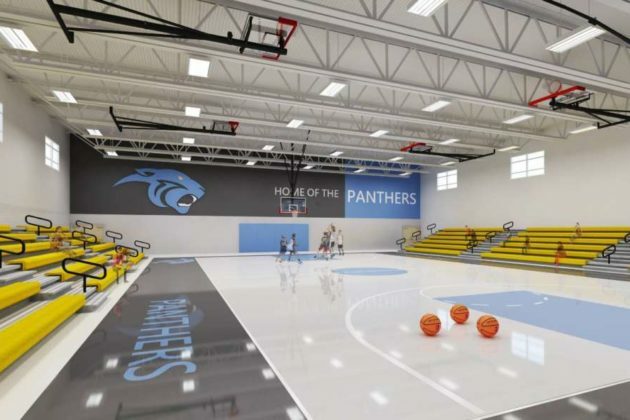 With work already underway, seventh grade core classes, English for Speakers of Other Languages (ESOL) and Spanish classes are now housed in “Panther Town” — modular trailers on the field adjacent to Ridge Heights, Monticchio wrote. Construction is estimated to be completed in 2021. Several major crime incidents surfaced over the last week. As we reported over the weekend, a Reston doctor was arrested on May 19 for assaulting an adult male patient during two separate visits. Police believe there may be other victims, but no new information has been provided. Yesterday, a 71-year-old woman was struck and killed by a car as she crossed at the intersection of Reston Parkway and Bluemont Way. The crash remains under investigation. One week ago, a former Langston Hughes Middle School teacher was charged with indecent acts with a child. Although the teacher was arrested last year, police only recently released details of the incident after a report by the Washington Post. 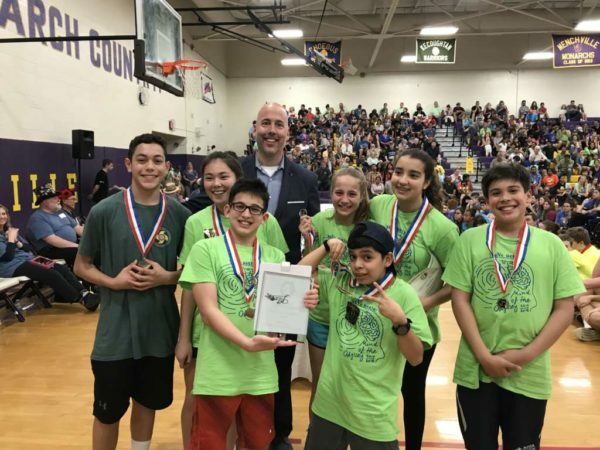 A seven-member team from Langston Hughes Middle School has advanced to the final round of the Odyssey of the Mind contest, an international educational competition that aims to develop creative problem-solving. Students apply creativity by solving problems that range from building mechanical devices to presenting an interpretation of literary classics. The team won second place in the Virginia State Tournament this month, qualifying them for the 39th annual world finals. The championship takes from on May 23 through May 26 at Iowa State University in Ames, Iowa. As the team prepares for the competition, it has launched a crowdfunding campaign to raise $14,000 to finance the journey, which includes expenses for housing, tournament registration and travel. In March, the team won first place at the regional competition at Thomas Jefferson High School, where they were challenged to present a humorous, documentary-style performance based on a classic. To the dismay of some area residents, a series of upgrades — including an amphitheater, fire pit and ping pong tables — are being considered for South Lakes Village Center (11120 South Lakes Drive). 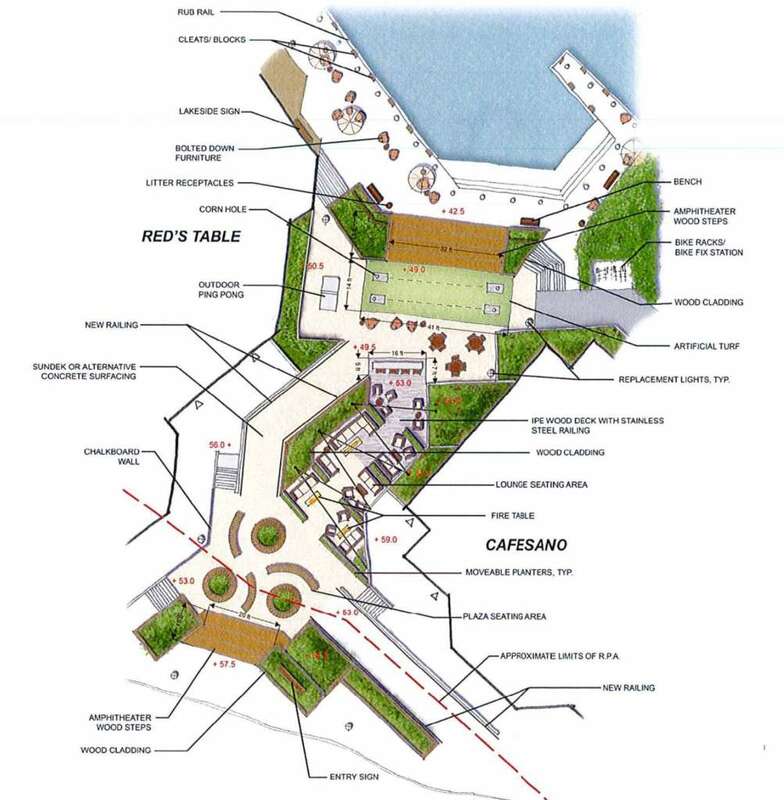 The project by village center owner Chevy Chase Land Company is intended to activate space at the edge of Lake Thoreau between Cafesano and Red’s Table. 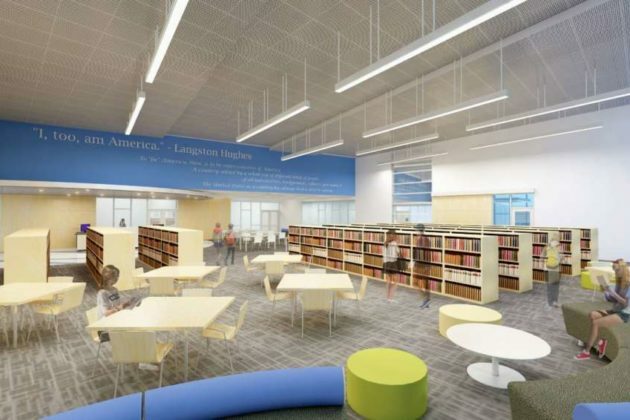 But residents near the center and merchants worry the new space will become a magnet for youth from Langston Hughes Middle School and South Lakes High School. The project would also increase noise — a concern that already rattles some residents as sound travels down the lake. Reston Association’s Design Review Board deferred a decision on the project Tuesday night to allow the development team, which includes engineering firm Kimley-Horn, to revise the plan. The DRB could consider updated plans at its next meeting. Mary Sapp, president of the Lakeport Cluster Association, said the project would increase noise levels, raise safety concerns due to unsupervised teens, and increase the chance of vandalism of the plaza’s “very attractive features.” Sapp said three of the cluster’s 11 bollard lights were destroyed, three were knocked over and two Safeway carts were thrown into the lake from the dock over the last 15 months. “We assure you that Lakeport Cluster is not ‘anti-students’; a number of our residents have children (or grandchildren who visit often), and several are actively involved with South Lakes High School,” Sapp wrote in a statement to the DRB. 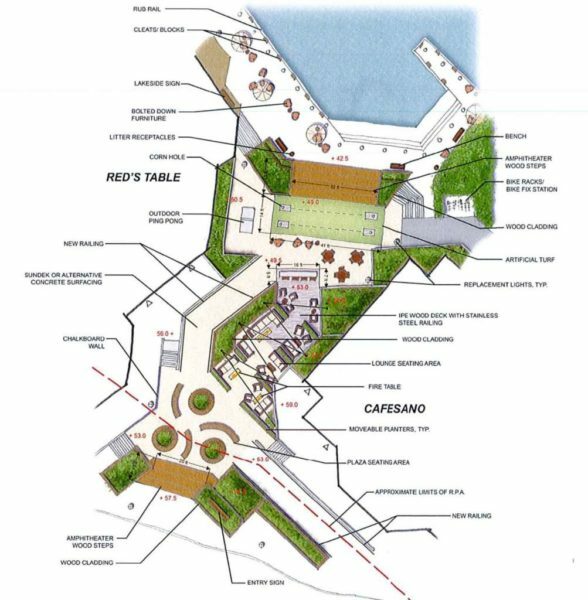 Upgrades include an amphitheater, new lighting, a chalkboard wall, outdoor ping pong, lounge and plaza seating area and outdoor ping pong. A new, back-lit sign is also proposed for the center. Gil Blankespoor, a resident in the Lakeport Cluster, questioned how the property owner will maintain the upgraded site. “We know Chevy Chase Land’s heart is in the right place. They did a fabulous job last year with the new landscaping, and their plan is to build community activities. But what they propose is in the wrong place — far too close to residential developments,” Blankespoor said. The development team said they were open to removing the gaming features of the site, including ping pong tables, in order to allay community concerns. DRB members also suggested removing outdoor cushions, which could end up in the lake, and adding more shaded trees. In response to concerns about attracting area teens, Michael Casey of Kimley-Horn said the plaza was open to “all generations” and should not exclude any demographic. By design, the commercial plaza is placed next to residential development, he said. “This is what community is,” he said. Given the “brutal reality” of the retail world, activating the space is necessary to ensure the long-term viability of the center, said Tom Regnell, president of Chevy Chase Land Company. “We are interested in that very long-term view,” Regnell said. Flickr pool photo by vantagehill. 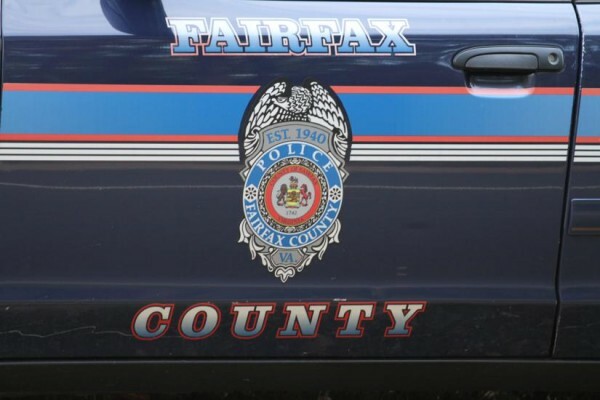 A lockdown at South Lakes High School, Terraset Elementary School and Langston Hughes Middle School around 12:40 p.m.was lifted earlier today, according to a Fairfax County Public Schools spokeswoman. Local police receive a report that a student with a gun was at South Lakes High School this afternoon. Police said the report was false and lifted the lockdown around 1:13 p.m.
School officials said the situation was resolved in a peaceful and quick manner. Hughes Middle School’s lockdown, which went into effect around 1 p.m., was lifted at 1:12 p.m. All classes resumed as normal by 1:25 p.m., according to the school’s principal, Aimee Monticchio. “Staff and students did a great job responding to a very delicate situation,” Monticchio said. Some parents said the school system did not inform parents and guardians of the lockdown quickly enough. Parents at South Lakes High School, where the lockdown occurred for 27 minutes, received an email about the three lockdowns at 1:21 p.m.
South Lakes HS, Terraset ES, and Hughes MS were placed into lockdown a short while ago while police investigate a potential threat. Police are at the school currently. All students are safe. We will provide additional information as soon as we can. Lockdown started at 12:40….why so long for an update. Very scary for all involved. My daughter said they ended the lockdown but then restarted it. South Lakes High School lockdown has ended after 27 mins. Elementary schools in Reston often give students in need food for the weekend. But that resource largely ends in middle school, adding to challenge of adjusting to the unfamiliar and sometimes daunting environment of middle school. 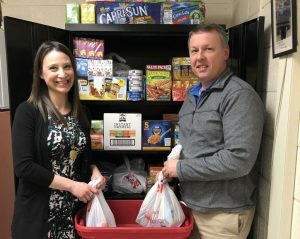 When school counselors at Langston Hughes Middle School realized this was the case, they partnered with two non-profit organizations to create a food pantry for students who need meals over the weekend. Since the program launched this year, 20 students have signed on. The list is growing. Roughly 35 percent of all students receive free or reduced meals at the school, down from nearly 40 percent in the 2014-2015 academic year, according to county data. “This is run by the community. We want to support all the kids in our building over the weekend so they can be ready for school,” said Marissa Brooks, a counselor at the school. To jumpstart the program, the school received a grant from Britepaths, a nonprofit organization that offers healthy meals, drinks and snacks over the weekend. Another nonprofit, Blessings in a Backpack, has also committed to providing bagged items through the end of the academic year. The school has an Amazon wishlist and accepts donations from 7 a.m. to 3 p.m. on weekdays. Accepted donations include dried fruit, snack packs, pasta, sauce and breakfast bars. Other local schools like Hunters Woods Elementary School and South Lakes High School also offer similar programs. 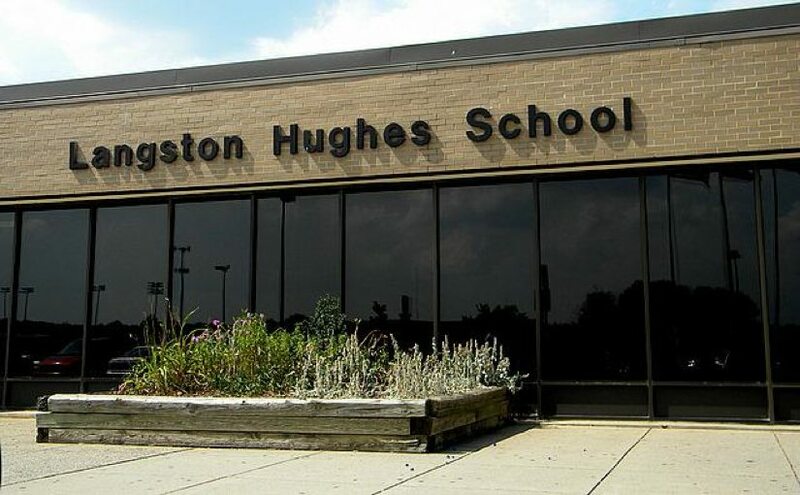 A plan to expand Langston Hughes Middle School (11401 Ridge Heights Road) heads to the Fairfax County Planning Commission today at 7 p.m.
Plans, reviewed by the county’s Dept. of Planning and Zoning in late December, call for a 3,500-square-foot art studio with a canopy at the front of the school. 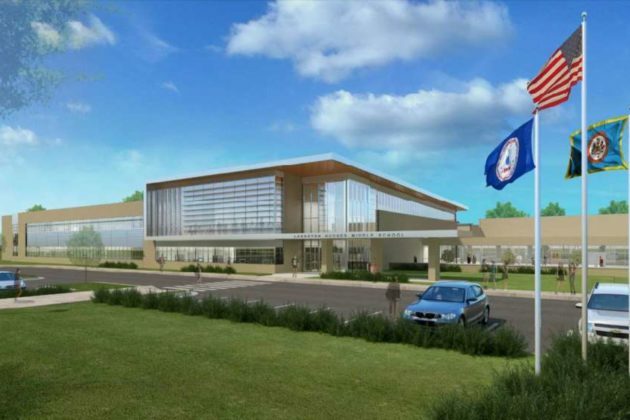 A two-story building would be attached to the back of the building, with classrooms and administrative offices on the main level and library and science labs on the second level. A courtyard will rest between the school and the two-story building. Another one-story building will include about 1,350 square feet with an expanded cafeteria. The number of parking spots will increase from 115 to 153, including new parking that will replace existing multi-purpose courts and 38 spots along Seahawks Drive. The project is expected to cost roughly $41.7 million in construction-related expenses. At the meeting, the commission will also hear public testimony on a plan to reduce the age requirement for McNair Senior Apartments (13430 Coppermine Road), which houses 139 independent living units on roughly three acres. The meeting (agenda here) will begin at 7:30 p.m in the board auditorium of Fairfax County Government Center (12000 Government Center Pkwy). A livestream will be available online. 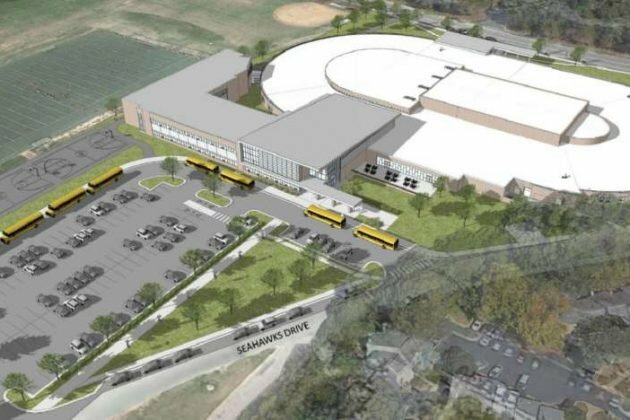 The Fairfax County Board of Supervisors at its meeting next week will vote on moving a $315 million Fairfax County Public Schools bond referendum closer to a public vote. In Virginia, a referendum can be put on the ballot for consideration by the voters only if it is ordered by the Circuit Court. At Tuesday’s meeting, the Board of Supervisors is being recommended to give its stamp of approval to the referendum. At that point, the county attorney would be directed to petition the court to order the referendum to be on the Nov. 7 ballot. The bond sales would be maintained in the annual amount of $155 million. Future debt service payments are referenced in the FY 2018-FY 2022 Adopted Capital Improvement Program. 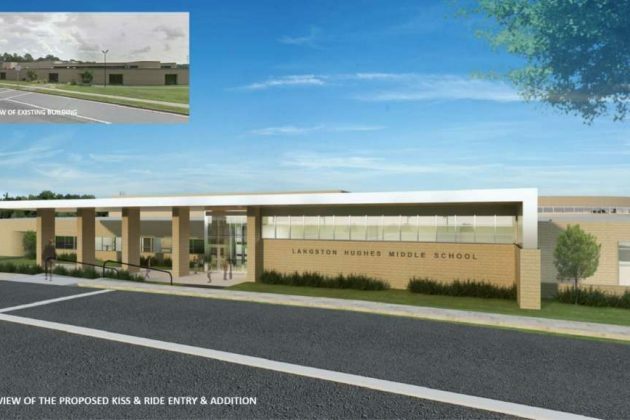 One of the most expensive items on the list of projects to be funded is construction at Langston Hughes Middle School. More than $41 million is budgeted for the work. 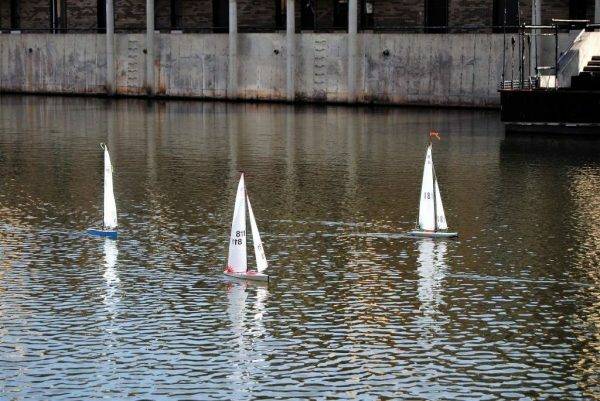 It’s another busy weekend in Reston, with plenty of fun activities on the agenda. The weather hasn’t been pretty for several days now, though, and it looks like rain will be prevalent again Saturday. We recommend you check the status of any scheduled outdoor activity before heading out. Reston Association’s Community Yard Sale, originally scheduled for Saturday, has been rescheduled for Sunday from 8:30 a.m. to noon at 1900 Campus Commons Drive. Eighty-five families will be selling a variety of items. In case of rain, call 703-435-6577 that morning to check the event’s status. It’s pool season in Reston. 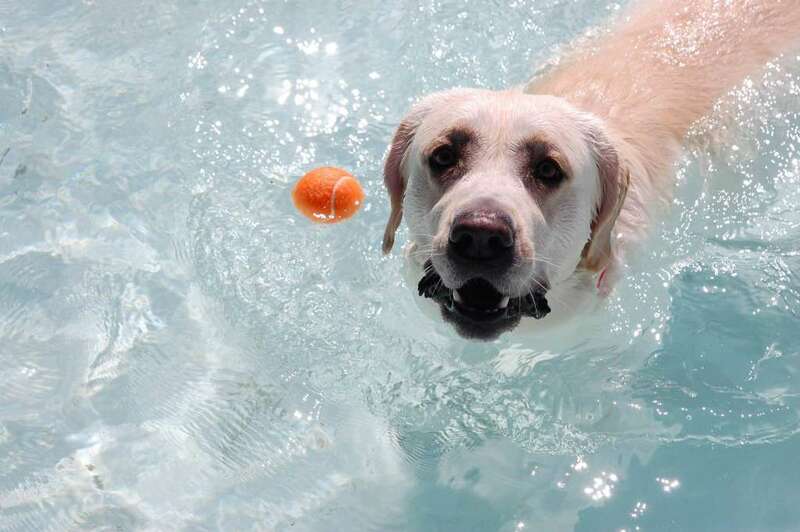 The North Shore and Ridge Heights pools are scheduled to open for the season this weekend, from 10 a.m. to 7 p.m. each day. The Reston Community Players will continue their staging of “Private Lives” this weekend. 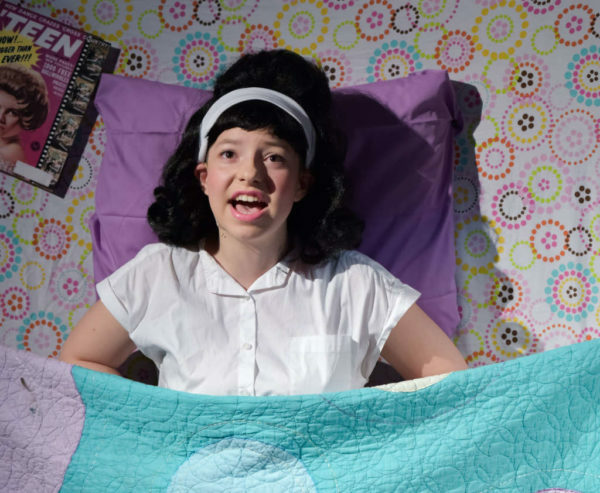 Performances will be tonight and Saturday at 8 p.m., along with a 2 p.m. performance on Sunday. Tickets are $21, or $18 for students with ID and senior citizens. Shows take place at CenterStage at the Reston Community Center (2310 Colts Neck Road). The Reston Farmers Market is scheduled for 8 a.m. to noon Saturday at Lake Anne Village Center. The South Lakes High School “Spirit of Reston” Marching Band will hold a rummage sale Saturday from 8 a.m. to 1 p.m. at the school (11400 South Lakes Drive). The event is slated to be held on the east side of the school, along Seahawks Drive; however, it will be moved inside if the weather does not cooperate. 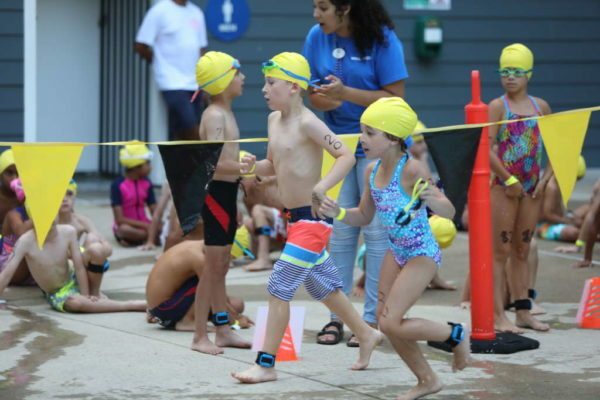 The seventh annual “Be Amyazing!” Reston Youth Triathlon is scheduled for Sunday morning. It consists of a swim at Ridge Heights pool, a bike ride on roads near South Lakes High School and a run on Reston Association paths. Lengths are different for each age group. 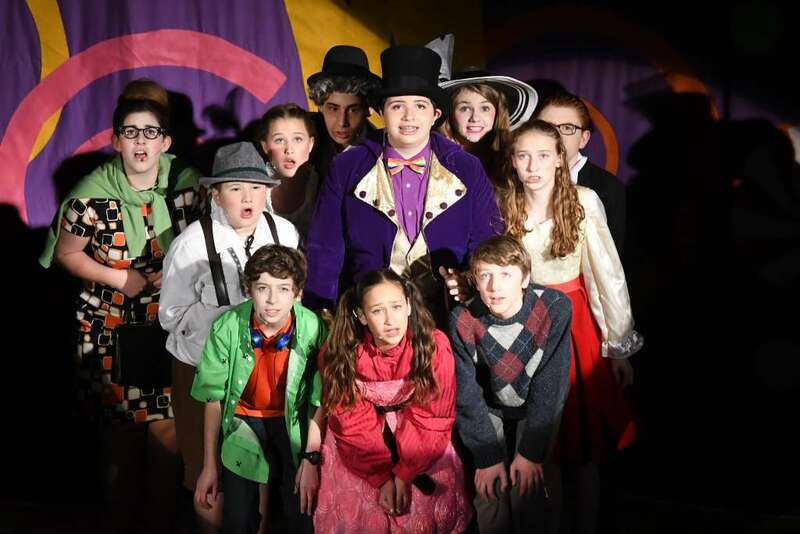 Langston Hughes Middle School (11401 Ridge Heights Road) is presenting “Willy Wonka Jr.” this weekend. The show will be performed tonight at 7 p.m., and at 3 and 7 p.m. Saturday. The NOVA Tour de Cure fundraising event of the American Diabetes Association is scheduled for Saturday, rain or shine, beginning at Reston Town Center. Reston Chorale will present its “A Season to Remember” show, celebrating 50 years of the group, Saturday at 7:30 p.m. at South Lakes High School (11400 South Lakes Drive). Tickets at the door will be $30. Those 62 and over will be admitted for $25; youth 17 and under will be admitted free, as will active military. Events at Reston Town Center this weekend include live music tonight from 6-10 p.m. at Tavern64 (1800 Presidents St.) and from 10 p.m. to 1:30 a.m. tonight and Saturday at Crafthouse (1888 Explorer St., formerly World of Beer); wine tasting at Il Fornaio (11990 Market St.) Saturday from 3-5 p.m.; a Mother’s Day brunch at Mon Ami Gabi (11950 Democracy Drive) Sunday from 9:30 a.m. to 3 p.m., and more. Lake Anne Brew House (11424 Washington Plaza W.) will host a special Mother’s Day “She’s Crafty” women’s beer event from 6:30-8:30 p.m. Sunday. Frying Pan Farm Park (2739 West Ox Road, Herndon) has a free Spring Farm Day planned for 10 a.m. to 3 p.m. Saturday. The event will included hand-churned ice cream samples, a dairy exhibit, children’s activities and crafts, blacksmithing, and antique equipment demos. Lake Anne is hosting Sunday Yoga on the Plaza each week, at 9:30 a.m.
Saturday from 2-3:30 p.m. at Reston Regional Library (11925 Bowman Towne Drive), local historian Jim Lewis will share the story of Japan’s secret plans to attack the U.S. mainland during World War II. Kalypso’s (1617 Washington Plaza N.) will have live music tonight, 9:30 p.m. to 1:30 a.m., from Bushmaster with Gary Brown. DJ Kram will play Top 40 hits Saturday night. Vinafera Wine Bar and Bistro (11750 Sunrise Valley Drive) has live music from 7-10 p.m. every Friday and Saturday night. This week they have Hilary Veltri tonight and Jason Masi tomorrow night. 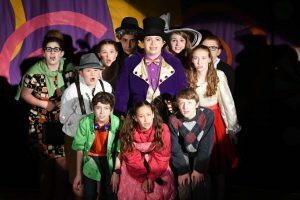 Reston’s Langston Hughes Middle School (11401 Ridge Heights Road) is getting ready to take the stage for opening night of its production of the musical “Willy Wonka Jr.” on Thursday. 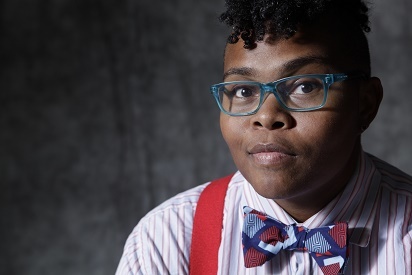 “Magic and mystery abound as Charlie Bucket experiences a delicious adventure on his golden-ticket tour of Willy Wonka’s mysterious chocolate factory,” organizers say. Performances are $10 and will begin at 7 p.m. on Thursday, Friday and Saturday, May 11-13. A matinee will also be offered at 3 p.m. on Saturday, May 13. Tickets can be purchased at the school during lunch hour or at the door.